The Secret Lives of Animals is the perfect mix of field guide know-how and armchair entertainment. In addition to the standard field guide notes and range maps, the meat of the book will offer up “spark moments” in nature—something fascinating or memorable that catches your attention and sets you on a path of lifelong learning. 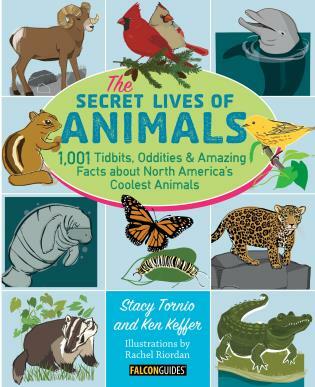 The Secret Lives of Animals will feature more than 100 North American animals and over 1,000 tidbits in a fun, colorful, illustrated format. Ken Keffer was born and raised in Wyoming. A vagabond naturalist and environmental educator, he’s worked in Alaska, Maryland, New Mexico, Ohio, Wisconsin, and the Gobi Desert of Mongolia. Ken enjoys floating on lazy rivers, birding, snowshoeing, fly fishing in the mountains out West, and walking his dog, Willow the Wonder Mutt. They are the authors of The Kids’ Outdoor Adventure Book and The Truth About Nature (both FalconGuides). Visit the authors at DestinationNature.net. The Secret Lives of Animals will delight kids who are interested in animals. .. .Teachers and homeschooling parents will find The Secret Lives Of Animals an interesting guide and chock full of interesting facts to peak kids’ interest in science, animals, and North America. Illustrations are wonderful and catch each animal in all its glory. .. .The Secret Lives of Animals, with its easy to read format, interesting and often-strange facts, and encouraging kids to explore their world, beginning with their own backyard, will be a hit with kids interested in animals, science teachers, and parents homeschooling their children.